When you’re looking for a popular, reliable, and stylish compact crossover SUV that offers all the versatility of a vehicle twice its size, consider the Toyota Rav4. One of Toyota’s more popular models since it released in 1994, this vehicle is available in many different configurations to make it safe for all-weather driving in Whitestown, but also expressive of your personality. 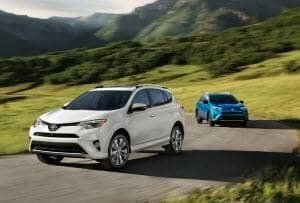 At Andy Mohr Toyota, we have dozens of different Rav4 vehicles on our lot for your choosing. No matter what your needs for your vehicle may be, such as transportation for your family or something to carry around your wide variety of pet rescues, we’re sure there is something exciting for you at our dealership. Whitestown is a tiny little town of barely 3000 people to the northwest of Indianapolis, yet once a year, it celebrates its multicultural appreciation with the Whitestown Festival of Lights and Indian Food Fair in the Whitestown Municipal Complex. Sample delectable Indian cuisine, watch a charming Bollywood dance demonstration, get yourself a henna tattoo, or shop some crafts. Coming this winter, we’re as stoked as you are to feast your eyes on the 2019 Rav4 model. The fifth generation has been highly anticipated by fans of the vehicle and it looks like everyone is getting what they want. With a standard 2.5L Inline 4-cylinder engine, you’ll have every bit of power you need. With the addition of Toyota Safety Sense™ 2.0, drivers will have access to such driver assist features like Pre-Collision System with Pedestrian Detection, Lane Departure Alert with Steering Assist, the all-new Lane Tracing Assist, and also brand-new Road Sign Assist. The second generation of Toyota’s added standard safety features doesn’t stop there, as you can expect even more from the 2.0. While right now our new inventory consists of the 2018 model, ready for you to drive it off the lot, we are waiting with bated breath to get our hands on the new ones. As of right now, however, you’ll be just as excited to get behind the wheel of the newest models we carry. Get ready for Toyota Safety Sense™ 1.0, as well as several different trim levels. In addition to our newer models, we have a generous used inventory as well. This inventory can be viewed both in person and online, but by checking it out online you will find incredibly detailed descriptions and a CARFAX® Vehicle History Report™ that will allow you to know if the vehicle has ever been involved in a minor, or not so minor, collision. If you’re looking for traditional financing for your new or used vehicle, you’ve definitely come to the right place. Regardless of your history, our team of qualified finance experts will work together to get you the car loan you deserve. Whether you’re hoping to continue your fantastic credit history or if you’re looking for that clean slate we all need sometimes, our special financing options are available for your assistance. 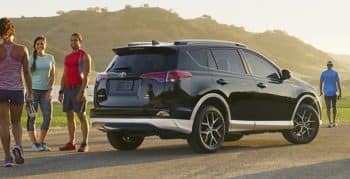 However, if you’re pretty sure that you’re only going to want to stick with your brand new Rav4 for a couple of years before you start checking out the new models hitting the market, consider leasing. You typically have a two- or three-year term that comes with a mileage limit and lower payments. At the end of the term you can turn the car in, with no questions asked, and get a new one in its place. If you want to wait it out to see when our all-new Rav4 models arrive, then we can definitely keep you posted, but you also have several other options. At Andy Mohr Toyota, we can help you find the right vehicle for all your travels and adventures in the Whitestown area.